McKnight Realty Partners is a full-service , fully-integrated real estate company that develops, owns, operates, and provides services for a portfolio in excess of 7 million square feet of office, industrial, retail, hotels, parking facilities, film production soundstages, and mixed use property. McKnight has focused its efforts on the adaptive reuse and repositioning of quality office building assets and landmark properties, pursuing development and investment opportunities throughout the country with a primary focus on its hometown, Pittsburgh. With 60 years of real estate experience, McKnight prides itself on providing the best-in-class space to its tenants, great service to its customers, and high returns to its investors. McKnight’s properties include The Heinz 57 Center (710,000 SF), The Grant Building (460,000 SF), The Oliver Building (470,000 SF), The Highline (700,000 SF) and Robinson Center (180,000 SF) in Pittsburgh, PA; Cranberry Woods (450,000 SF) in Cranberry, PA; Warrendale Commerce Center (440,000 SF) in Marshall Township, PA; 3 & 4 Park Central (680,000 sf) in Dallas, TX; and Huntington Center (400,000 sf) in Cincinnati, OH. In addition to these trophy properties, McKnight owns and operates an additional 1 million+ square feet of residential, retail and industrial assets throughout Southwestern Pennsylvania. Although its “bricks and mortar” real estate holdings are extensive McKnight understands that its true business is tenant satisfaction and attention to detail. 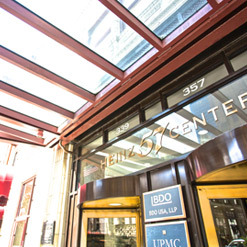 2000 NAIOP Western Pennsylvania Chapter Renovation Award: Gimbels Landmark Building, 623 Smithfield Associates, L.P.
McKnight Realty Partners is owned by The Rudolph and Perlow Families. The Rudolph family has been in the real estate business since 1959 and has acquired or developed a substantial number of properties. In addition to its commercial real estate business the Rudolphs launched several successful businesses, including Wendy’s of Greater Pittsburgh. The Rudolphs founded and built Wendy’s of Greater Pittsburgh and several retail affiliates to a 60-store organization with nearly $70 million in annual revenues and then sold the franchise portfolio to Wendy’s International in 1995. Operating under the corporate banner of The McKnight Group, the Rudolph family continues to carefully build an integrated enterprise of real estate investments, development and asset management. The Perlow Family, along with the Fine family, co-founded Interstate Hotels Corporation (“IHC”) in Pittsburgh, Pennsylvania in 1960. Under the control of Edward Perlow and Milton Fine, IHC evolved into one of the world’s leading hospitality management companies developing, acquiring and operating hotels across the country, including numerous Marriott hotels. By 1996, IHC was ranked number one in sales ($1.3 billion), properties (212) and rooms (43,178) according to HOTEL & MANAGEMENT (March 1997). IHC remained the nation’s largest hotel management company until June 1998, when Patriot American Hospitality REIT acquired them for $2.1 billion. In 1989, the Perlow family founded Perlow Investment Corporation, now run by Charles S. (Chuck) Perlow, to manage a diverse portfolio of stocks, bonds and real estate. The real estate portfolio has included numerous commercial properties such as hotels, office buildings, shopping centers, apartments and restaurants.